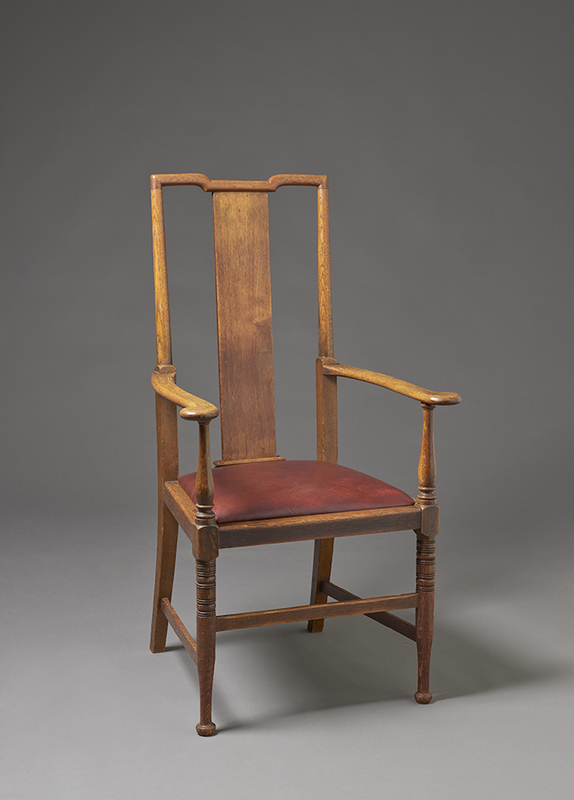 A chair of this pattern, with a rush seat, belongs to the Victoria and Albert Museum (CIRC. 24.1 and 2-1958). ‘In 1958 Elizabeth Aslin, the museum’s nineteenth-century furniture specialist in the Department of Circulation, visited the Tabard Inn, Bedford Park, Chiswick, which was then being refurbished. Aslin saw a collection of furniture intended for disposal, and recommended that the V&A acquired a chair of this pattern from the licensees, Messrs. Patrick & Macgregor. When originally acquired, the chair was thought likely to have been designed in the office of the architect Richard Norman Shaw, who designed the Tabard Inn 1879-1880. In 2008 Andrew Saint, author of Richard Norman Shaw (1976) confirmed that it was unlikely that Shaw’s office was responsible, as there is no evidence to support the theory.